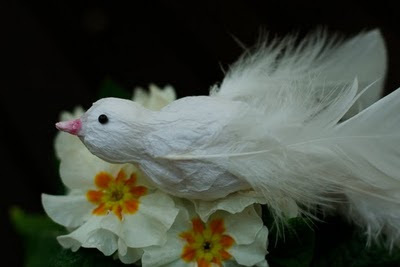 Wedding Birds - made from marabou feathers, crepe paper, map pins and styro balls. New bags that double as paniers for your bike. They are double bags with a sturdy heavy zip on the back and a lighter zip under the flap. These are still prototypes and am still working on the construction of them. I will probably put some sort of velcro strips in the middle of the two bags to attach to the back of the bike. Flat waisted little girl's skirts with elastic at the back for a more flattering fit. A floating attached heart for a bit of whimsy. It's been a bit slow around these parts in terms of people attending the markets and people buying. It seems like the Financial Crisis has finally hit us marketeers in Newie. K-Rudd's money from last year to keep us out of recession has finally run out and people are holding on tight. Alas the sewing hasn't been as cranking as I would have liked to, but people I'm back with a renewed sense of energy and the Janome is doing double time and the ideas are flowing. I'm thinking up my new range of wares for Spring/Summer 2010 and I can't wait. My younger sister is getting married and it's going to be a handmade extravaganza. 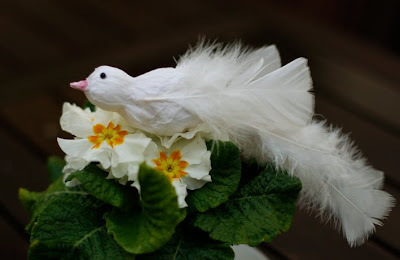 So far I had made, with the help of nieces and bride, 21 handmade birdies, destined for table arrangements. Only another 20 odd birds to go. I've finished the invites and am waiting on one other thing to include and I'll give you a sneak peek as soon as I post them all off. Good times people, good times. Have you ever! Love the little skirt best of all. The heart is a sweet little touch that makes it so unique. Hope things pick up with the markets now that we're heading towards summer and Christmas :) Love the bags! You are amazing Di. Those birds are absolutely beautiful and the bags are rocking!!! !